doesn't upset me. Sadly the Triang collectors mentality has infected other parts of the hobby, so many of the new models, with all that delicate detail to get broken, just sits in collector's cupboards. One reason why I wish they did not go so far trying to get everything accurate, when gauge is wrong. The 1980s models were fine, in many cases, just needed a better motor and chassis. I daren't 'play' with some of the new models . Thing about those old Triang models is getting that old plastic to stick together. Must be addictive, the smell of sawn up plastic! Thing about those old Tri-ang models is getting that old plastic to stick together. Must be addictive, the smell of sawn up plastic! I use polystyrene solvent when gluing plastic to plastic with the old Tri-ang toys' bodywork and Bostik when attaching bodies to underframes (plastic or die-cast). 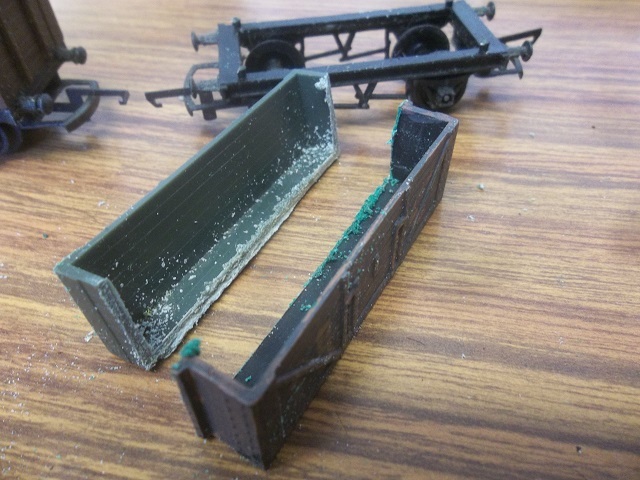 This way the body and chassis can be separated using a craft knife should the need arise at some time in the future (such as replacing a damaged underframe) but the body seams are solid, having fused the plastic. I also reinforce the cut and shut with either card or styrene sheet applied internally. In this case a false floor of card glued in with Bostik. FI mogul #19 stands out like a sore thumb among the dirty black steam locos on the FCPyF so it needs something doing to it, even if only a repaint. Anyway, what I'm doing is taking the saddle tank (from the die-cast loco that was cut up to provide the cab for Pacific #9) and grafting it onto #19's boiler. The question arose though, do I use the tank as is to cover the full length of the boiler or do I shorten it so that it sits forward of the steam dome? 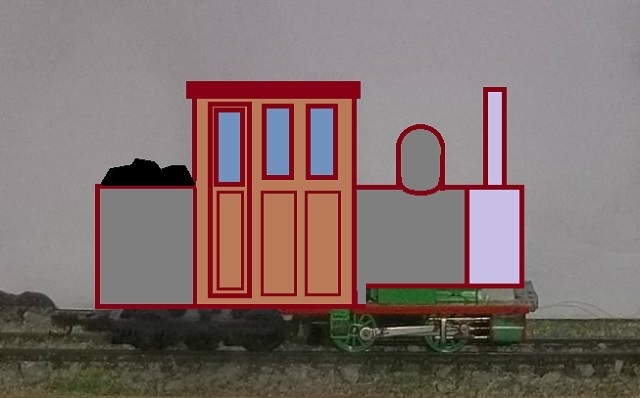 Either way the sand dome needs removing from the boiler but the shorter tank would save work on the steam dome - and also leave the front doors of the cab unobstructed. I prefer the shorter tank version, not least because it saves a bit of work refitting the steam dome. I had considered a short tank fitted between the cab and the smoke stack but dismissed this because it would be the worst of both worlds, involving work to shorten the tank and refit the steam dome! Also - it would look like this (click) and I don't want the FCPyF tank to be a copy of somebody else's. The conversion will be completed by fitting a fuel bunker on the rear, though with less of an overhang than shown in the link above. Alternatively the fuel tank (it's going to be an oil burner) could be on the cab roof in a similar manner to the 0-4-0WT that used to be on the NYMR in the 1970s. I prefer the latter idea because it will give the loco a shorter overall length and, more importantly, it will shorten the rear overhang so there's not so much swing on curves. Anyway, after sitting looking at it for half an hour I took the hacksaw to the tank and shortened it to fit in front of the steam dome, then removed the other boiler fittings from the loco. The smoke stack is a bit too tall to sit on top of the tank so I might replace it with a shotgun stack made from a piece of suitable tube. The sand dome requires a bit of filing so that it will sit astride the tank and the diecast dome will become the tank filler. That just leaves the bell and the electricity generator to be relocated. The generator will fit on the walkway under the tank and the bell will go somewhere on the front of the loco. Yes, I was considering a trailing truck under the cab, like the one I added to my Forney conversion, but an alternative to balance the looks out would be to make it an 0-6-0 by shortening the front end. The area in front of the smoke box could be cropped by about an eighth of an inch and replacing the cowcatcher with a step pilot would take another third of an inch or so off the front of the loco too. I've got a day off work today and the weather's not promising for a dog walk. I've had to stop for a while now to allow the filler in the tank and fuel bunker to set before adding another layer (probably this evening). The story of how it got to this stage is, as usual, blogged. That's quite a change from the original #19, Bob. As you say, some U.S. saddle tanks looked decidedly odd though others did look "right". Good use for the cast saddle tank, but I can't help being reminded of a small jockey on a large horse. The tank capacity somehow does not seem to match the size of the engine; I wonder what it would look like if the tank was deeper - say at least down as far as the centre-line of the boiler or even down to the running board, using two bits of shaped balsa with an overlay of thin styrene or even paper. If the join looked too obvious a handrail would help to distract the viewer's eye, or else the addition could be made to look like a later tank extension. Just a thought - the loco is already a world away from its original incarnation. 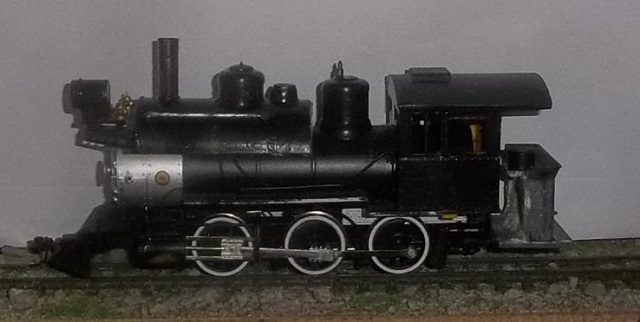 the WW1 Baldwin locos on the 60cm gauge had a very large saddle tank. Point taken gentlemen, but the FCPyF is well supplied with water and the small saddle tank is maybe to keep the axle weight down for branch line use. Either that or it's supplemental to a well tank? Small tanks in relation to boiler size are not unknown in the real world. I thought that was Rule #1 ?? As another part of the excuse for the small tank I've fitted the generator on the driver's side footplate, in front of the Westinghouse pump, and I'll add an air reservoir in front of that when I can find a suitably sized piece of tube or rod. Hopefully the exhaust steam from the jenny won't interfere too much with the driver's forward view. The FCPyF has too many locos! But since when has that stopped a modeller making more? Inspired by Giles's (Project 2012 thread) Forney I've been looking at the possibilities of a similar 0-4-4T for myself. The critical factor to enable reliable running on tight curves should the FCPyF be extended to an L shape (which is a serious consideration for next summer) is the bogie pivot. Pivoting it to the loco in the normal fashion would give a long fixed wheelbase but attaching it, Mallet fashion, at the inner end would enable it to swing freely on curves.